EMS Copiers are proud to continue their support of the fantastic work carried out by the team at Pieta House. This year marks Pieta House’s 10th year and on September 1st Pieta House will open its 10th crisis intervention centre. To highlight this amazing achievement CEO Brian Higgins has bravely taken on the Pieta “Grand” Tour. 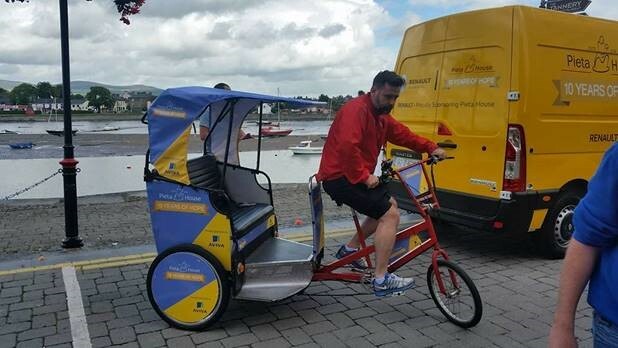 This is a 10-day awareness and fundraising cycle encompassing 1,000km around Ireland to highlight the incredible work of Pieta House over the past decade and highlighting the challenges ahead in the struggle against suicide and self-harm. Come out and support Brian on the completion of his journey on Friday, 9th September. Brian is due to arrive into the Clarion Hotel, Liffey Valley @ approx. 5pm.